Performed at Joe Lounge London 28-30 church road. 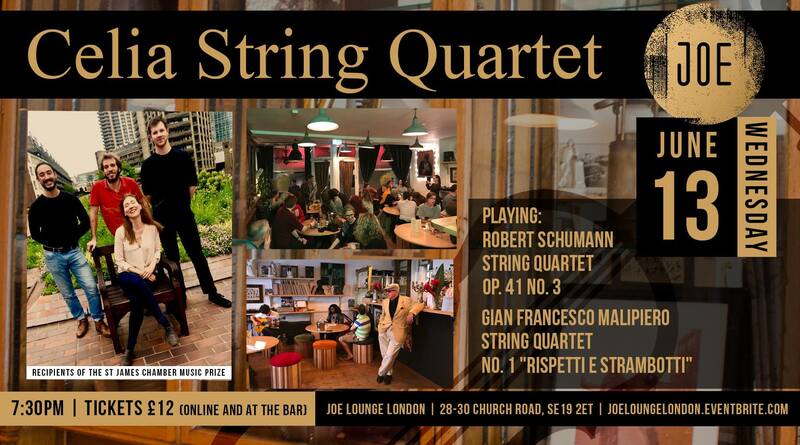 The Celia String Quartet, formed at the Guildhall School of Music and Drama, was born out of Johanna’s, Andrea’s, James’ and Joshua’s passion for the string quartet repertoire. Recipients of the St James Chamber Music prize, they have been fortunate enough to participate in masterclasses with the Takács and Danish quartets to mention a few. They have also performed at the Wigmore Hall and look forward to engagements in Bath and London during their 2018/19 season. The members of the quartet have studied in some of the leading music universities of England, Italy and Germany and their interpretations are a refreshing result of the combination of different ideas and approaches. The quartet, mentored by Simon Rowland-Jones and Jacqueline Ross, have been heralded as having a ‘stylist awareness with a strong identity’ and actively seek out lesser-known works, which they enjoy combining in their concert programmes. Passionate chamber musician and experienced orchestral players, the members of the Celia Quartet have already performed in hall such as Amsterdam Concertgebouw, New York Carnegie Weill Hall, and as member or leader of orchestras such as the Gustav Mahler Youth Orchestra and the Bayerische Philharmonie. When the quartet is not performing, they are passionate about teaching chamber music and amongst them hold positions at the Saffron Centre for Young Musicians, Junior Guildhall and are regular guest tutors at Pro Corda.